This season, a significant number of our shareholders took us up on our offer to contribute to a 'Food Insecurity Fund'. 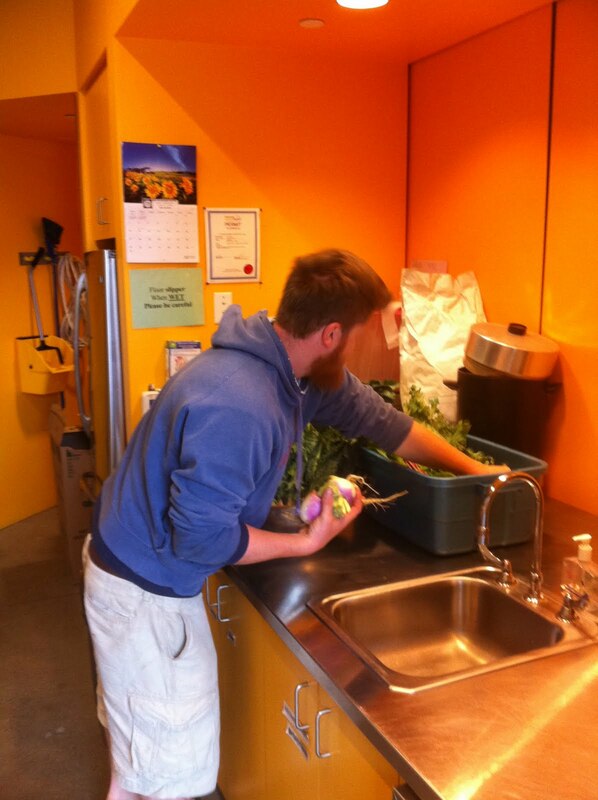 The fund is comprised of an optional $50 donation by our shareholders with the total sum matched by Inner City Farms. We deliver a weekly volume of fresh, local veggies to Oppenheimer Park Community Kitchen every Tuesday morning during the growing season. The produce most often ends up in the giant soup pot and helps feed the fine folks that share a meal at the park. Cam and Jofty (a volunteer at the kitchen) talking shop. empty bin -> full pot -> empty pot -> full bellies! Thank you to all of our shareholders who helped make this partnership a reality and thank you to all the volunteers at Oppenheimer Park for cooking great meals for great people. We hope to post a few more pictures and stories from the park's kitchen as the season unfolds. Stay tuned! It has always been my dream to start my own restaurant and have a busy kitchen as yours. I wish you luck in your business! That's very interesting. I hope you achieve your goals in your business.